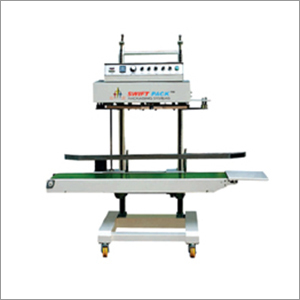 We can customize the Heavy Duty Continuous Band Sealer as per client's requirements. These products are extremely sturdy in nature, with the energy consumption of 230 W, quick speed of sealing, which is 0 to 10 m per min and with the sealing width of 8 to 10 mm. Our Heavy Duty Band Sealer Machine is universally famous for its high quality and performance standards. Located at New Delhi, India, we have a team of experienced professionals, whose aim is to work hard and provide the clients with the best band sealing machine of continuous type. Our expert and dedicated team of engineers, technicians and other allied workers offer after-sales support as well as training to the clients, as a part of our business of service provider. All the business activities are handled under the guidance of our mentors, who have supported us to attain a leading position in the market.